Spinach Lasagna Cups are tasty, little bite-sized lasagnas filled with three cheeses, spinach and a tomato-basil sauce. Baked in a muffin tin, these mini lasagnas are a fun appetizer, great for parties, or even just a light meal. 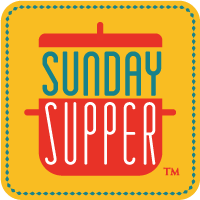 This week Sunday Supper partnered with Gallo Family Vineyards to share recipes and wine pairings for Game Day Entertaining. Today everybody is sharing a game day recipe and pairing it with one of Gallo Family Vineyards wines. The wine I selected was Merlot, and to my surprise, Gallo included a Pink Moscato in the package. That was a very nice treat! When coming up with a game day recipe, Spinach Lasagna Cups immediately came to mind. Anything made in a muffin tin is always very popular, so these would be perfect! I envisioned a bite-sized lasagna filled with tomato sauce, three cheeses, spinach and layered using wonton wrappers in place of noodles. I have seen similar ‘lasagna cupcake’ recipes all over the web, but there were many so inconsistencies from recipe to recipe, I decided to come up with my own. The result was everything delicious and cheesy about lasagna in a portion-controlled, easy to serve cupcake. While I made a vegetarian Spinach Lasagna Cups you can easily make it your own by substituting your favorite vegetables, meats or cheeses. This recipe is great for entertaining because there is a lot of flexibility to get creative and to customize it to your guests’ preferences. The filling can be prepared ahead of time, which is always a plus when it comes to party planning. No matter what variety you make, Lasagna Cups are a hit at any party and will disappear quickly! When deciding what wine to pair with these Spinach Lasagna Cups, the choice was easy. Merlot is one of my favorite wines to have on hand for entertaining because it is so versatile and goes well with a wide variety of foods. The Gallo Family Vineyards Merlot is rich, smooth and flavorful. The blended flavors of black cherry, ripe plum and hints of oak are simply delicious. This wine complemented the Spinach Lasagna Cups absolutely perfectly and would be a delightful pairing with many other foods on my game day menu. Not only does it pair well with tomato-based pasta dishes, but Merlot goes well with chicken, grilled meats and vegetables and more! Wondering what wines to pair with your game day menu? Let the Gallo Family Vineyards’ Food & Wine Pairing Tool help you decide. Then use the store locator to find where to buy Gallo Family Vineyards wines near you. Preheat oven to 350° F. Spray a standard 12-cup muffin tin with cooking spray and set aside. Layer 1: Place a wonton wrapper in each prepared muffin cup, pressing gently to fit pan. Next put a generous tablespoonful of ricotta mixture on top of wonton wrapper. Cover the ricotta cheese with pasta sauce and then sprinkle with mozzarella cheese. Layer 2: Gently press another wonton wrapper on top of the mozzarella cheese. Repeat layering with ricotta mixture, sauce and mozzarella cheese. Sprinkle tops with crushed red pepper, if desired. Bake for 15 to 20 minutes, or until cheese is melted and bubbling and wonton wrappers start to turn golden on the edges. Remove from oven and let site for 5 minutes. Serve warm! Recommended wine pairing: Gallo Family Vineyards Merlot is excellent with this dish! After having this I may never go back to making and eating lasagna the traditional way. So awesome indeed!! I couldn’t agree more…anything muffin tin sized is perfect for parties. These look perfectly delicious! Oh, man, do these look irresistible, Alida!!! That cheesy topping sold me in an instant! These are a great way to serve lasagna at a party! I love how he wonton skins hold their shape! Alida! I love that you made mini bite-sized lasagnas . . and they are vegetarian so I love them even more!!! Such a great idea! I love everything about these. Perfect for parties. Thank you for the nice recipe and have a Great Sunday! Lasagna I can eat with my hands? I’m in! My three year old would be, too!